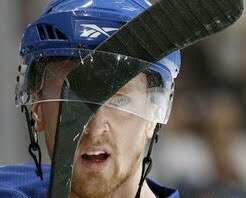 On April 15th in 2010, Anze Kopitar of the Los Angeles Kings inadvertently high-sticked Henrik Sedin of the Vancouver Canucks in Game 1 of the Western Conference Quarter-finals lodging his stick into the Art Ross winner's helmet. Despite direct evidence of a high-sticking infraction, the play went unpenalized presumably owing to the absence of an injury. When questioned as to the non-call, the referee Kelly Sutherland responded that the high-stick was "very gentle" and didn't warrant a whistle. Interesting. 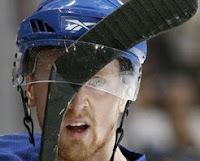 The Canucks won the game 3-2 no thanks to the officiating.